So goes the first line of the poem 'The Windmill' by Henry Wadsworth Longfellow, written in 1880. This proclamation rings true today as you travel along the B4598 from Chainbridge to Usk, you can't fail to notice the wonderful, 60ft high restored windmill at Llancayo, about 2 miles before you reach Usk. It stands majestic in a field, its sails outstretched like giant arms reaching for the wind, with the hills of Wentwood in the far distance and the fields and woods of the Usk Valley providing a scenic backdrop. A windmill for a retired pirate! The mill was built in around 1813 by privateer, Edward Berry. After years of privateering and sacking of French ships, during the Napoleonic Wars, Berry decided to take up farming and settled down in the Vale of Usk, where he built the mill and nearby farms. The mill was used to grind wheat. 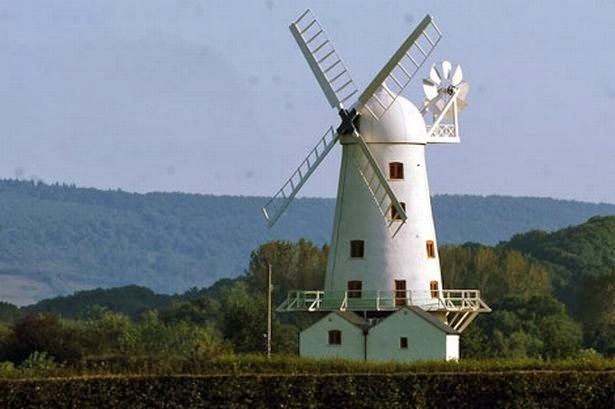 Mr Evan Williams (owner in 1959) recalled - "The man who placed the windmill here knew his business. No matter how calm the day may be elsewhere there is always a wind on this field" (extract from a newspaper article printed in 1959 by Monmouthshire Historian, Fred Hando). 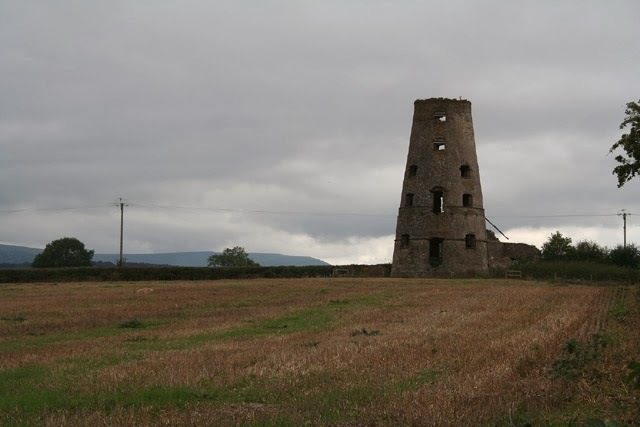 Llancayo windmill was a tower or "smock" mill., so called because of the way it resembled the 'smocks' worn by farmers and millers. At the summit, the cap was arranged to support the shaft and the sweeps (sails), and to rotate so that the sweeps faced into the wind. 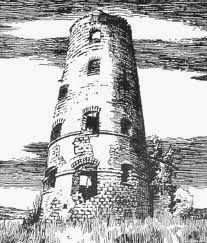 This type of windmill first appeared in the 16th century. The walls of the tower are 2'2" thick, the diameter at ground level is 26' and there are five floors. The working life of the mill was short, it was destroyed by fire in around 1830. 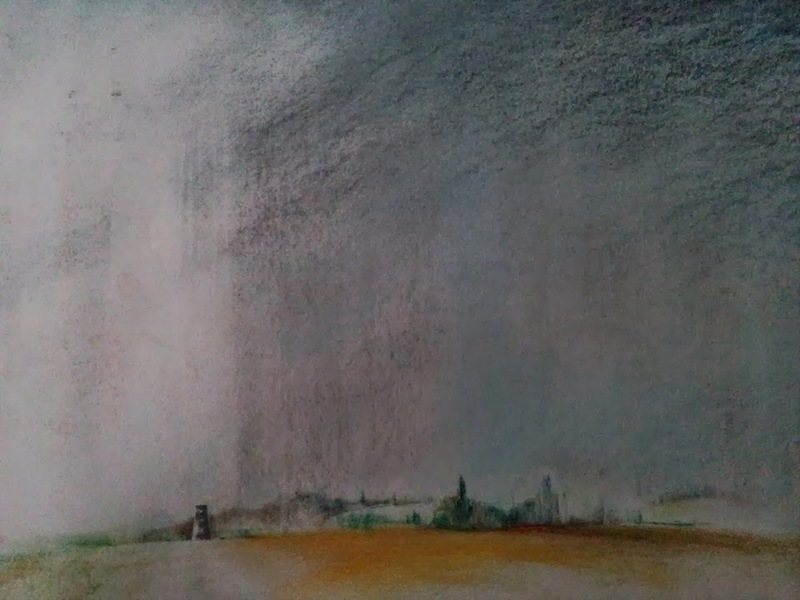 No-one knows for sure how the mill burnt down, but the favoured story is that on a still summer morning the miller went to market leaving the sweeps (sails) coupled to the gearing. A fierce wind blew up, the coupling became red hot and the brakes ignited the timber. When the miller returned the mill was a flaming torch and past saving. 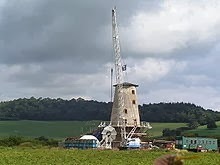 The windmill remained a ruin for over 160 years until local property developer, Peter Morgan bought the land and the windmill in the late 1990s. It took seven years to gain planning permission, but renovation work finally started in 2006 with the aim of rebuilding the mill and adjoining cottage in an authentic style, using locally-sourced materials. The mill finally opened its doors to guests as luxury holiday accommodation in summer 2009. 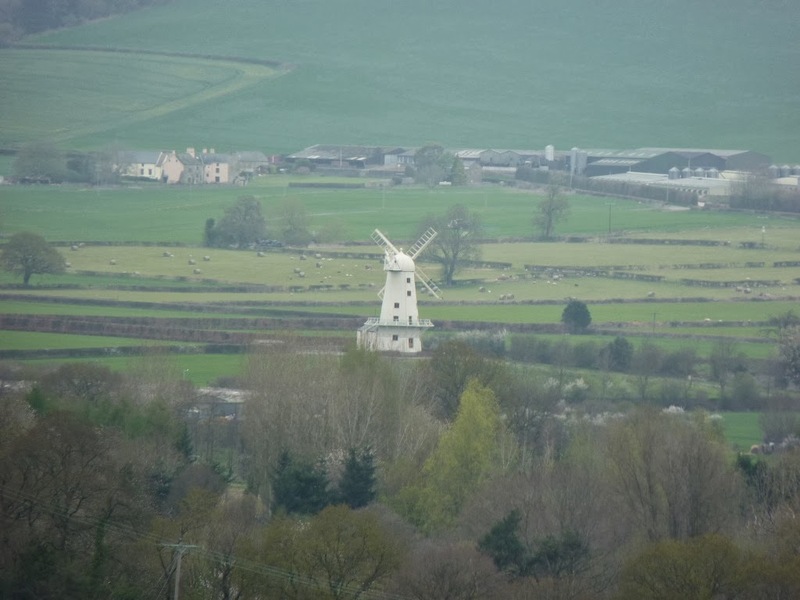 As a child I remember going to Usk Show which was held during the 1960s and 1970s on fields at Llancayo, and seeing the ruined windmill and wondering what it looked like before the fire, so it is wonderful to see the windmill restored in all its glory. 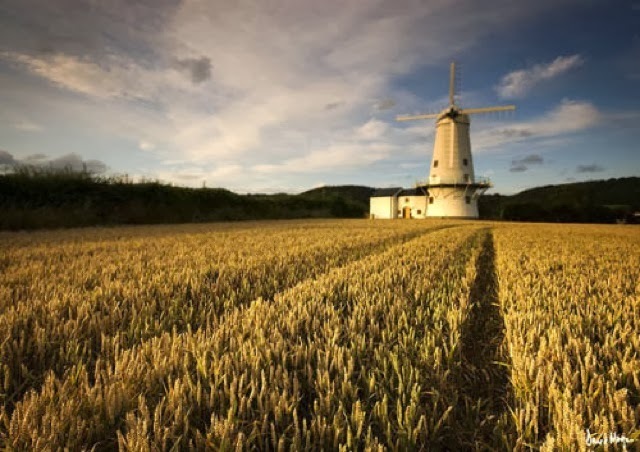 I have included some links to some walks that incorporate views of the windmill at the foot of this page. Who makes him lord of lands. And all is peace within. or floodlit at night, also means I'm nearly home! I stopped the car and took this photo in Nov 2013.